WILLEMSTAD - At about half past nine tomorrow morning the new station ship of the Dutch Navy, Zr. Ms. Van Amstel arrives in Anna Bay and will receive a ceremonial welcome with salutes from Fort Amsterdam. 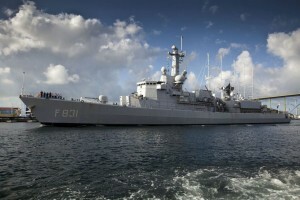 The multipurpose frigate will then moor at the Matheywerf. Van Amstel, which replaces Zr. Ms. Holland will be used in particular in anti-drug operations and in emergencies during the next four months. Last year in October Holland assisted in Haiti after the passing of Hurricane Matthew. Various drug shipments were intercepted also, often in collaboration with the Caribbean Coastguard and a Law Enforcement Detachment of the U.S. Coast Guard. The last time the Zr. Ms. Van Amstel was docked here was in 2015.